Every couponer has at some point complained about the fine print on a coupon. It is always filled with restrictions keeping us from using the coupon on trial or travel, or restricting the number of coupons we can use, or any other wording that keeps us from using the coupon in different ways. “Redeemable at food, drug, and mass merchandise stores. Consumer: Limit 1 coupon per purchase of indicated product(s). You pay any sales tax. You are NOT eligible to use this coupon if you are a government beneficiary. You are a government beneficiary if you are enrolled in any federal healthcare program, including Medicaid, Medicare (Part D or otherwise), or any similar federal or state programs, including any state pharmaceutical assistance program. Further, you CANNOT use this coupon if you are Medicare eligible. For coupon eligibility purposes, all those 65 or older will be considered Medicare eligible. RETAILER: GSK will reimburse you the face value of this coupon plus $.12 Handling Fee if submitted in compliance with our Redemption Policy. Copy available upon request. Cash Value 1/100 of $.01. Coupon is void if altered, transferred, exchanged, sold or auctioned, copied or if prohibited by law. Good only in USA and at APOs, FPOs. Send Coupons to:GSK Consumer Healthcare, PO Box 880658, El Paso, Texas 88588-0658 2015 GSK. Read and follow label directions.” Italics are mine and added for emphasis. So basically if you are on any government healthcare program like Medicare or Medicaid or you are OVER 65(! ), you cannot use this coupon. I reached out to the GSK helpline to try and figure out what is going on here and they said there is an interesting reason why this change was made and why we will continue to see language like this on Sensodyne coupons and possibly more coupons in the future. 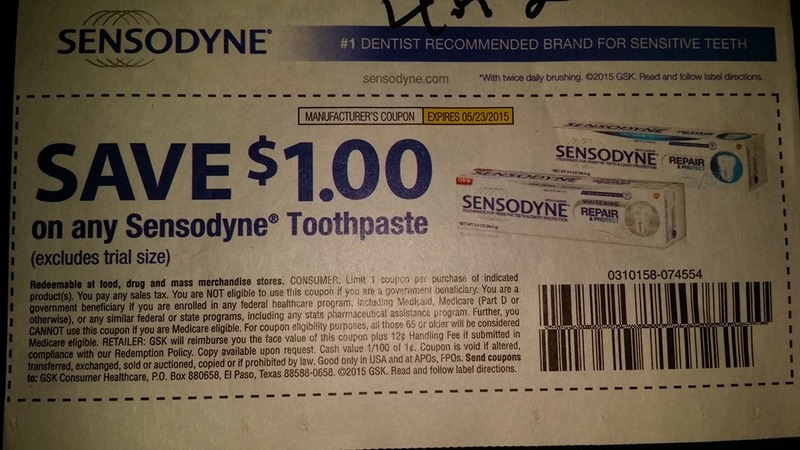 They said that if you are on a federal healthcare program, you are already eligible for some kind of discount on Sensodyne products so you can’t stack discounts because it is considered an OTC drug in the new healthcare guidelines. 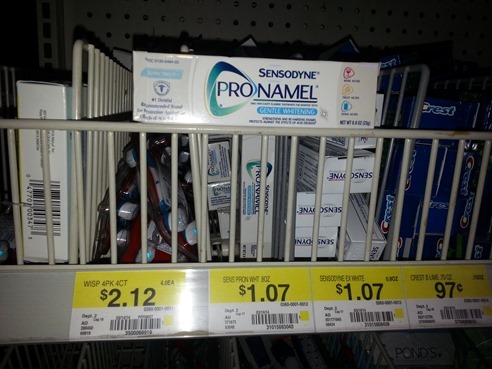 But Sensodyne isn’t sold behind a pharmacy counter so how are you supposed to get a Medicare discount on it when you buy it at Walmart? Does Medicare allow for some kind of reimbursement program where you can get paid back from the government if you buy Sensodyne? I don’t use Medicare or Medicaid so I’m really not sure how this works, and the helpline wasn’t real clear on this point. I guess the important takeaway is this didn’t happen as a result of some crazy anti-Obamacare conspiracy at GSK. Whoever the head of GSK is, he isn’t sitting in his office behind a Confederate flag looking for ways to stick it to those useless leaches on the government dole. (You think I’m being funny. This was the general consensus on the internet where I first saw this.) This is just a company doing its best to comply with the new rules put in place by our revamped healthcare system. I guess the takeaway here is that we will have to start being a little more diligent in reading that fineprint on our coupons moving forward. And be sure to subscribe to our daily email to never miss an important story like this. UPDATE: Coupons in the News did a story giving a bit more information and revealing this language also appeared on Tums and Flonase coupons. 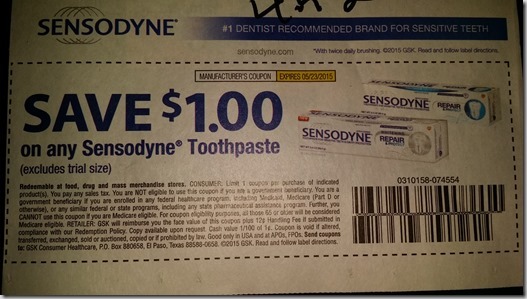 FREE Sensodyne Pronamel Toothpaste and $.93 Money Maker! 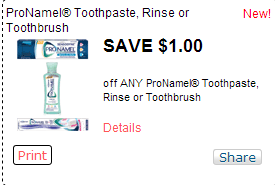 Check out this better than FREE Sensodyne Pronamel Toothpaste! I had trouble printing this from Chrome, if it won’t print switch to another browser. UPDATE: Looks like the Red Plum Q is gone but the Shopmium deal is still good.